Warning! Christmas is sneaking up! The mad rush, with a to-do list as long as Santa’s beard, will be here before you know it. So why not take a little relaxing creative time now to create a few beautiful cards? You know you WANT to! And we are here to inspire you with a few magical cards created by our crafting experts mixing Santa Baby, Heaven Sent, and a few other wintery Prima products! 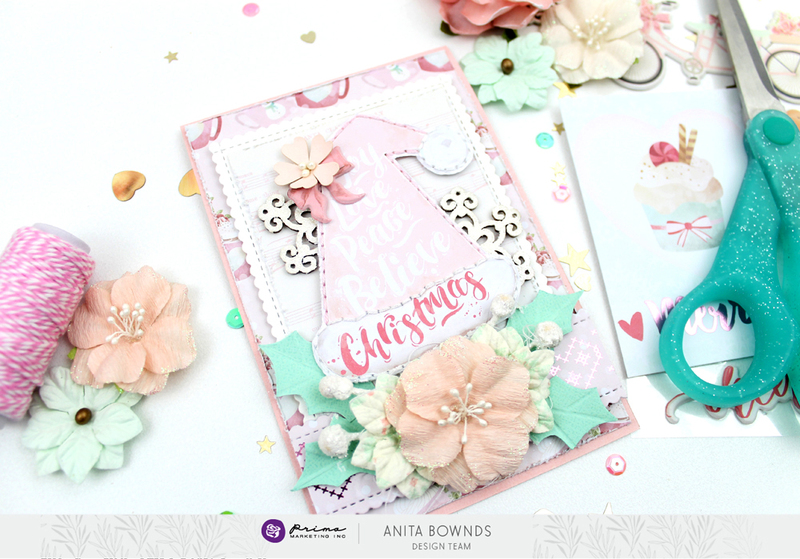 Anita mixed Santa Baby papers and embellies to create this gorgeous pastel-flavored cards! Santa Baby papers provide so many FUN holiday elements that are perfect for cutting apart! Not a card maker? That’s okay, our products work beautifully across the craft genre platform! Try a cute handmade tag to set your gift apart this year. You can find more holiday ideas on this link here! More Beautiful Georgia Blues PTJ!